How is that a hit?” Most baseball fans have said this after the scoreboard flashes the result on a sharp grounder or botched fly ball. The person in charge of making these hit/error determinations is the official scorer, often an anonymous recorder of stats until his judgment puts him in the spotlight. Recently I had a chance to shadow Stew Thornley, one of the Twins official scorers, to get firsthand insight into this sometimes misunderstood part of the game. 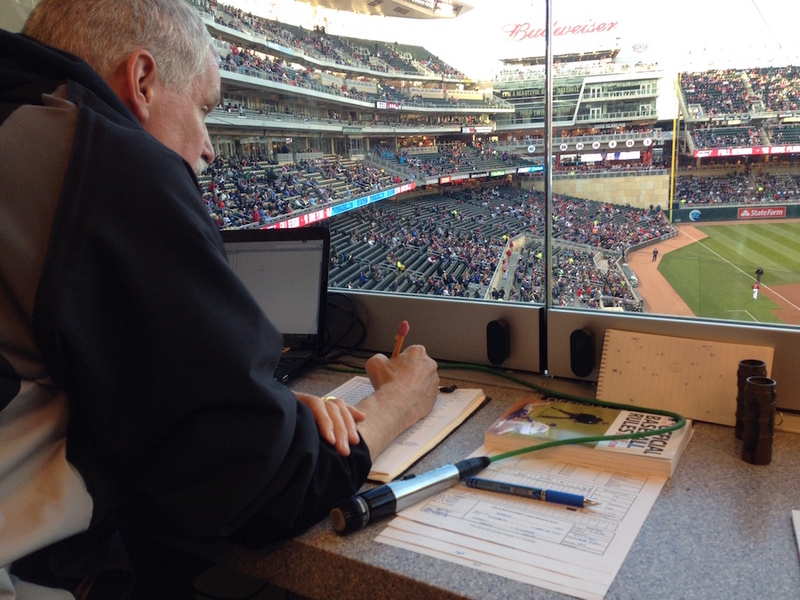 At Target Field, the official scorer sits in the first seat in the front row of the press box on the left as you’re looking at the field. When I picked up my media pass I noticed the person who signed in before me was from MBC Korea, one of that country’s three major broadcasting systems. Most of the time the press box was quiet, punctuated mainly by the sound of typing. For the official scorer, the tools of the trade include a laptop, binoculars, a scoresheet plus extra notepads to keep pertinent information close at hand and a TV monitor showing the FSN feed. I realized quickly how useful it was to have the monitor on a ten second delay, not just for the official scorer but also for the datacaster who sits next to the official scorer and is responsible for recording all game action for those following online. There is no specific time the official scorer needs to get there before the game, Thornley said, but it’s his preference to arrive early and get into a routine (routines are not just for the men on the field). When I arrived at 5 pm for a 7:10 start he was already there, double-checking information for that night’s game. Official scorers are paid $170 per game and are employees of Major League Baseball, not any specific team. Last year, Marie-Claude Marcotte-Pelland joined the few female official scorers in Major League Baseball history when she worked a Blue Jays-Marlins game in Toronto. In mentioning this, Thornley, a member of the local chapter of the Society for American Baseball Research (SABR), also shared the story of Eliza Green Williams, who secretly served as the official scorer in the 1880’s for the Chicago White Stockings or Colts, the team that would be renamed the Cubs in the next century. She would submit her reports as “E.G. Green” so as to not identify herself as a woman. There is a distinct element of “hurry up and wait” in the job as an official scorer, as we casually chatted about the baseball topic of the day until a sharp grounder caused all eyes to turn to the video monitor while the official scorer grabbed the microphone to announce his ruling on that specific play. As the game went along, there were also periodic announcements from Dustin Morse, the Twins Senior Director of Communications, for such things as pitching changes and home run distance announcements. “I was nervous when I first started with the Twins,” Thornley admitted, while he explained the tension between wanting to get the call right and wanting to sound confident and announce the call right away. If players or teams strongly disagree with a call, they can submit it to Major League Baseball for review by the league office. He said he has gotten more complaints from the batting team if they don’t get a hit. The evolution of official scoring is an interesting aspect of the history of the game itself, and Thornley chairs a SABR committee that studies and interprets the changes throughout the years. As we looked upon a beautifully manicured grass infield, he reminisced about how everyone was told that the advent of artificial turf meant that you would never have to worry about a bad hop. When the third baseman took up the shortstop position during a shift, I asked him if the sometimes dramatic shifts employed by teams in recent years can get confusing for those recording stats. He professed his love for the teams who put player numbers on both the front and back of the jerseys and said you can often look for other distinguishing features – for example, in the game I attended, two of the Tigers infielders were sporting high socks. Ok, now this is a cool article! That was a lot of fun Sarah! Very fun! I try to get there early and Stew is always there first!! He is also such a baseball encyclopedia. Fun to talk with, or just listen to! It takes a great many people to make a MLB game work. Fun to hear a little about one of the most important (and least paid, if not least celebrated) positions in a game. Professional baseball is made up of so many people who perform so many critical tasks almost anonymously and I find it really interesting to learn more about some of those people. Thank you, Sarah. Great article. I've only gotten to talk water quality with Stew. Good guy. Good scorer. A little too cat-friendly if you ask me, but you didn't. Why would you? Thanks for writing this. I enjoyed looking in on this part of the game. Cool read, thanks to all parties for doing it! I used to keep book when I went to a game on my own back in my single days during the late '80s. I never did it for the purpose of compiling stats or anything; it was more just an OCD thing to do and it really kept my focus on the game. My routine was to purchase an orphan single ticket from a scalp---um, independent broker---and find a vacant seat near the field by the second inning or so. After that a visit from a beer vendor and a hot dog vendor and I was set. From what Stew has previously mentioned on this site, MLB dictates that official scorers err on the side of giving players hits instead of errors so this rant is not directed toward him but this is an absolute pet peeve of mine. You physically have to throw the ball in the stands and have the batter reach second base for anyone to get an error these days. Pop up dropped? It must have been the sun. Hit. Ground ball a foot to the third baseman's left? Hit, he had to range 12 inches for that ball. Bad throw to first that beat the batter by three seconds? Hit, he might have beat it out. Ball kicked around the outfield? Triple, Cabrera was thinking three all the way. It's ridiculous, in my opinion, and I don't understand how no one bats .400. Pardon me for expecting MLB players to be better skilled defensively than your common Little League team.